This would be the perfect size for my family. I am always looking for healthy options for my family that is great tasting too. From what I understand this would be ideal for my family. I would love to have it as it is a healthier way to fry chicken, onion rings, etc. The Power AirFryer XL would help my husband and I eat healthier. Just perfect! I would love this because it will be much healthy than frying them on the stove. We absolutely love fried foods, but have been doing without them in order to eat healthy, so this would be great. We love fried foods but don't like the calories. This machine would be perfect for us. My best friend has been wanting one, so I would love to win this for her. 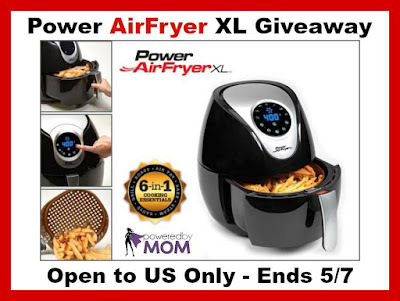 I would love to have this because I have always wanted a fryer to make French fries and anything else I can make in it. I would like to win this for my family so we can eliminate the use of oil/grease in our diet but still achieve a fried food taste. I've always wondered if the air fryer makes things taste, well uh "fried"?